Is the earth surrounded by an intricate electromagnetic grid network offering free energy? This compilation of material on ley lines and world power points contains chapters on the geography, mathematics, and light harmonics of the earth grid. Learn the purpose of ley lines and ancient megalithic structures located on the grid. Discover how the grid made the Philadelphia Experiment possible. Explore the Coral Castle and many other mysteries, including acoustic levitation, Tesla Shields and scalar wave weaponry. Browse through the section on anti-gravity patents, and research resources. 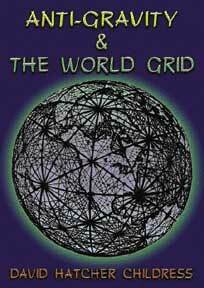 Packed with information and maps of the Earth Grid, this is the best-selling book of its kind! ANTI-GRAVITY AND THE WORLD GRID Edited by David H. Childress. 274 pages. 7x10 Paperback. Appendix, Patents, Illustrated, References.